Cacharel Amor Amor. Eau de toilette vaporisateur natural spray. 0712801713 o 3318184710. Cacharel Amor Amor Eau de Toilette 30ml Spray - For Her. The differences are the amount or the concentration of oils that are in the scents. The higher the concentration of oils, the longer your scent will last, and the less you should need to apply. Frasco vacio Amor Amor Cacharel eau de toilette woman . El estado es Nuevo. Enviado con Correos: cartas ordinarias. FABRICANTE: CACHAREL. DEVOLUCIÓN: ¡Garantizamos su satisfacción! POLITICAS DEVOLUCION. No hay recogida local. No podemos combinar el envío. POLITICAS DE ENVIO. EAN13: 3360373065196. PARTNUMBER: 3360373065196. Cacharel, AMOR AMOR body lotion 200 ml CACHAREL AMOR AMOR es una fragancia creada en 2003 que ha tenido mucho exito entre el público español. NOTAS DE FONDO DE AMOR AMOR: Sándalo, Vainilla, Ambar Gris. Revlon Amor es en Fragrance 50 ml. El estado es Nuevo. Enviado con Correos Express / Paq 24. AMOR AMOR SUNRISE DONNA. EAUDE TOILETTE VAPORISATEUR NATURAL SPRAY. Dai un'occhiata alle mie inserzioni ! Per maggiori informazioni o richieste particolari non esitare a contattarci. Base notes: amber, tonka bean, vanilla, virgina cedar and musk. Character Ingredientes Made in UAE. EAU DE TOILETTE SPRAY 100ML. NEUF SOUS BLISTER. Cacharel Amor Amor In A Flash 100ml EDT. A bold, youthful and freshly oriental fragrance from Cacharel. Cacharel Amor Amor L'Eau Eau De Toilette 100ml Spray - For Her. The differences are the amount or the concentration of oils that are in the scents. The higher the concentration of oils, the longer your scent will last, and the less you should need to apply. Cacharel Amor Amor Forbidden Kiss EDT Spray 30 ml Brand New in the box. 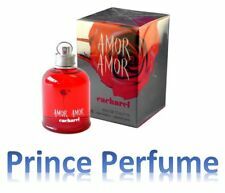 Amor Amor Forbidden Kiss is a sweet fruity fragrance by Cacharel. It was launched in 2011. Top notes: grapefruit, mandarin orange, pink pepper, fruity notes. Middle notes: coffee, frangipani, peony. Base notes: musk, vanilla, woodsy notes. Ora o mai più, l'amore non aspetta! E' un filtro, una pozione, un diletto, la quintessenza di brama e golosità. Condizioni di Vendita. Amor Amor Forbidden Kiss Eau De Toilette Spray 100 ml Top Notes: Mandarin, Grapefruit, Pink Pepper Heart Notes: Frangipani, Peony, White Musk Base Notes: Coffee, Black Vanilla Launched in 2011, Cacharel Amor Amor Forbidden Kiss is aimed at the younger population. Inspired by rebellious and forbidden love, its slightly darker than its predecessor. 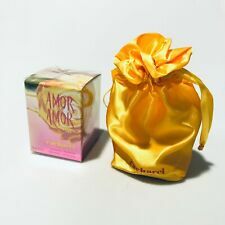 Cacharel Amor Amor Eau de Toilette - 30 ml Brand new in the box. As Intense and exhilarating as a first kiss, Amor Amor is the fragrance of instant temptation and ultimate seduction. Sensual vanilla and jasmin mingle with sparkling blackcurrant; let the scent wrap around you both. Instant attraction. instant desire, instant Amor.